Born 1973 in Chiba, Japan. Graduated from the Department of Architecture and Environment Systems in the College of Systems Engineering at the Shibaura Institute of Technology in 1995. Received a doctorate in engineering from the institute in 2001. Held positions as a postdoctoral fellow, senior lecturer, and Japan Society for the Promotion of Science Overseas Research Fellow at the Universiti Teknologi Malaysia from 2003 to 2009. 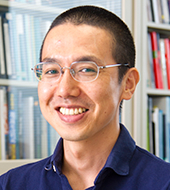 Associate professor at Hiroshima University since 2009. The main focus of his research is on energy-efficient housing in Malaysia, Indonesia, Vietnam, and other emerging countries of South East Asia.